Lyme disease is caused by the bacterium Borrelia burgdorferi and is transmitted to humans through the bite of infected black-legged ticks. Typical symptoms include fever, headache, fatigue, and a characteristic skin rash called erythema migrans. If left untreated, infection can spread to joints, the heart, and the nervous system. Lyme disease is diagnosed based on symptoms, physical findings (e.g., rash), and the possibility of exposure to infected ticks. Laboratory testing is helpful if used correctly and performed with validated methods. Most cases of Lyme disease can be treated successfully with a few weeks of antibiotics. Steps to prevent Lyme disease include using insect repellent, removing ticks promptly, applying pesticides, and reducing tick habitat. The ticks that transmit Lyme disease can occasionally transmit other tickborne diseases as well. Early: A small, red bump often appears at the site of a tick bite or tick removal and resolves over a few days. This is normal after a tick bite and does not indicate Lyme disease. Rash - from 3-30 days after infected tick bite, an expanding red area might appear that sometimes clears in the center, forming a bull’s-eye pattern that expands slowly over days and can spread to 12 inches across. Flu-like symptoms - fever, chills, fatigue, body aches & headache may accompany the rash. For early cases, prompt[specify] treatment is usually curative. 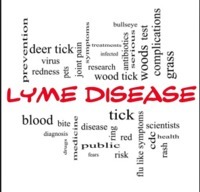 However, the severity and treatment of Lyme disease may be complicated due to late diagnosis, failure of antibiotic treatment, and simultaneous infection with other tick-borne diseases (coinfections), including ehrlichiosis, babesiosis, and immune suppression in the patient. A meta-analysis published in 2005 found some patients with Lyme disease have fatigue, joint or muscle pain, and neurocognitive symptoms persisting for years, despite antibiotic treatment. Patients with late stage Lyme disease have been shown to experience a level of physical disability equivalent to that seen in congestive heart failure. Lyme disease occurs regularly in Northern Hemisphere temperate regions. Africa: The bacterium infested ticks have been identified in Morocco, Algeria, Ebypt and Tunisia and Kenya. Europe: In Europe, Lyme disease is caused by infection with one or more pathogenic European genospecies of the spirochaete B. burgdorferi sensu lato. Cases of B. burgdorferi sensu lato-infected ticks are found predominantly in central Europe, particularly in Slovenia and Austria, but have been isolated in almost every country on the continent. Incidence in southern Europe, such as Italy and Portugal, is much lower. United Kingdom: In the United Kingdom the number of laboratory confirmed cases of Lyme disease has been rising steadily since voluntary reporting was introduced in 1986 when 68 cases were recorded in the UK and Republic of Ireland combined. In the UK there were 23 confirmed cases in 1988 and 19 in 1990, but 973 in 2009 and 953 in 2010. Provisional figures for the first 3 quarters of 2011 show a 26% increase on the same period in 2010. North America: Many studies in North America have examined ecological and environmental correlates of Lyme disease prevalence. Canada: Owing to changing climate, the range of ticks able to carry Lyme disease has expanded from a limited area of Ontario to include areas of southern Quebec, Manitoba, northern Ontario, southern New Brunswick, southwest Nova Scotia and limited parts of Saskatchewan and Alberta, as well as British Columbia. Cases have been reported as far east as the island of Newfoundland. Mexico: A 2007 study suggests Borrelia burgdorferi infections are endemic to Mexico, from four cases reported between 1999 and 2000. United States: Each year, approximately 30,000 new cases are reported to the CDC however, this number is likely underestimated. The CDC is currently conducting research on evaluation and diagnostics of the disease and preliminary results suggest the number of new cases to be around 300,000. South America: Tick-borne disease recognition and occurrence is rising. In Brazil, a Lyme-like disease known as Baggio–Yoshinari syndrome was identified, caused by microorganisms that do not belong to the B. burgdorferi sensu lato complex and transmitted by ticks of the Amblyomma and Rhipicephalus genera. The first reported case of BYS in Brazil was made in 1992 in Cotia, São Paulo. B. burgdorferi sensu stricto antigens in patients have been identified in Colombia and Bolivia. Singer Avril Lavigne was diagnosed in December 2014 with Lyme disease. In September 2015, billionaire John Caudwell discussed his family's experience with Lyme. Kathleen Hanna’s experience with late-stage Lyme disease. Professional basketball player and WNBA MVP Elena Delle Donne has discussed her experience with Lyme.